Just before the event at Rich Mix we were asked by host Roopa Farooki to sum up our novels in one word. This is a much harder task than you think – to condense your novel into one expression that powerfully conveys what you have written, that does it justice. The evening focused on our writing – how we developed as writers, the genesis of our novels. I spoke about how the idea of One Man’s Revolutionhad been sparked by an old news clip of The Rolling Saint, who had come to London on a promotional tour in the early 1990s and found the bone-chilling April rain more of a challenge than the deserts and jungles of India. Both Shereen Tadros and Yoanna Pak were inspired by stories buried deep within their family history that were crying out to be exhumed. 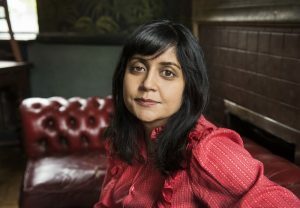 The readings were inspiring – Kavita Bhanot gave us an insight into the wonderful chaos and cacophony present in a family home on Birmingham’s Boulton Road. Mona Dash read an entertaining excerpt on the Art of Writing. Omega Douglas gave a beautiful rendition from Hibiscus, Rose, Jacaranda. We were asked if our writing had cost us anything – I joked that it had cost me my sanity. Making art requires sacrifices and time and solitude are often in short supply, whether it is family lives or careers that divert attention. All of us felt that to be shortlisted among such impressive writers both present and past (Mahsuda Snaith, Winnie M Li, Kit de Waal) was a great honour and an enormous validation for our work. An audience member asked what kept us writing, considering our busy lives, I think Mona spoke for all of us when she said because I love it, I love the art of writing.